Beavercreek Junior Gavin Coots dribbles the ball through center field as Centerville junior midfielder Ryan Forino defends, Oct. 9 at Beavercreek High. Centerville won the game, 2-1, to claim the Greater Western Ohio Conference’s National East title. 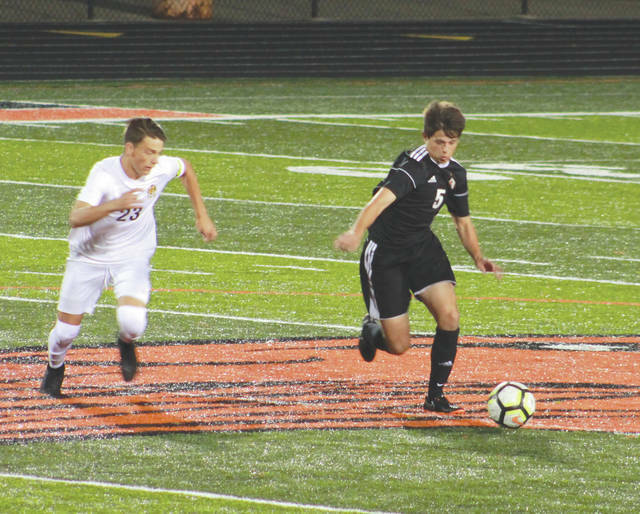 BEAVERCREEK—With the Greater Western Ohio Conference’s National East division title on the line, the visiting Centerville Elks defeated the host Beavers, 2-1, Oct. 9, handing Beavercreek its first conference loss of the year. Centerville junior, Ryan Forino put the game away as he raced downfield and gathered a pass behind the defense. His first shot was partially deflected by Beavers goalie Garrett Arbogast. However, Forino quickly picked up the rebound and shot the ball into the goal. The lapse in defense was the second Beavercreek mistake of the night, and Centerville made them pay. A few minutes before the final goal, Beavercreek appeared to have all the momentum despite being down by one. They took multiple shots off corner kicks and had sustained pressure trying to tie the game up. Beavercreek senior Ryan Wightman scored the Beavers’ only goal late in the second half to tie the game. Ultimately, Beavercreek was unable to maintain the momentum to close out the game. While this loss was disappointing for Beavercreek, Guiliano emphasized that there was still more chances to play this year. The team has a final regular season game before playing in the postseason tournament a week from Thursday. Despite this loss, Beavercreek will still have the opportunity to defend its Division I state championship. The Beavers will play their final regular season game at 1 p.m., Saturday Oct 13 at Walnut Hills. They then begin postseason sectional tournament play Thursday, Oct. 18 when the tournament’s top seeds will host either Fairborn or Sidney in a 7 p.m. second-round match. Joshua Woolverton is a student intern for Greene County News from Cedarville University. If you are interested in covering sports for the Greene County News, contact sports editor John Bombatch at 937-372-4444, Ext. 2123.